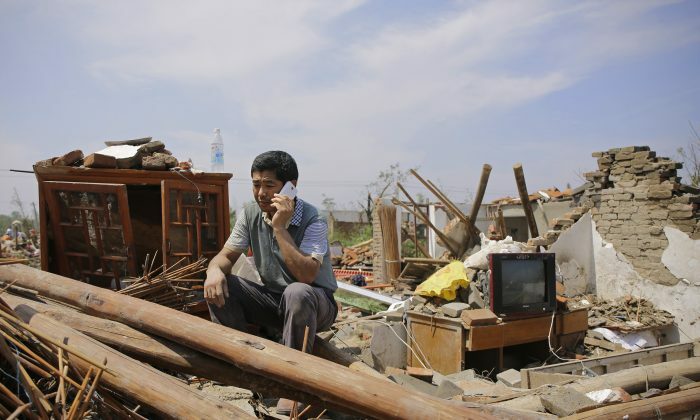 After a tornado and hail storm ravaged the coastal province of Jiangsu in China, killing nearly 100 people and hospitalizing nearly 1,000, Beijing’s Ministry of Civil Affairs did what it often does: asked the public for money. Authorities publicized the account number of an account the public could donate to, on the Sina Weibo account of China News Network, a state mouthpiece. Within hours, the comment section was crammed with criticism, as over 70,000 Weibo users, most of them seemingly angered, condemned the campaign as another way for corrupt officials to line their pockets. “Here comes a chance for corrupt officials to make a fortune,” netizen “Harvest” wrote. The page disabled comments the following morning. The June 23 hurricane was Jiangsu’s worst in half a century, according to the province’s meteorological department. By June 25, 99 had died from the disaster and another 846 were hospitalized, according to the news mouthpiece of the Jiangsu provincial government. A Legal Evening News report said that the hurricane was the most devastating worldwide since 2003. The fury from Weibo users is borne out by bitter experiences. In 2008, the nation grieved as a 7.9 magnitude earthquake shook Sichuan Province, taking away lives of tens of thousands, a large number of whom were students. Funds from charities, celebrities, and the public reached a record-breaking 65.2 billion yuan (about 9.8 billion dollar), according to Tencent Finance. Donors were disillusioned, however, when it was later found that much of the money didn’t go to where it was actually needed. Mingjing, an overseas news website, estimates that nearly 80 percent of the amount, or about 50.1 billion yuan (7.53 billion dollar), was squandered in one way or another. “It reflects a shift in public sentiment over the years,” Henan lawyer Ji Laisong told Radio Free Asia. Ji said that public distrust of government credibility is now normal. “I think they’ve fallen into a Tacitus Trap,” Ji said, meaning that the public opposes whatever the regime does now, whether it’s a good policy or not, because they have lost trust in its credibility. “Every time we come across natural disasters, the government asks us ordinary people for donations,” Mr. Liu, a peasant who said his land had been stolen, said in an interview with Radio Free Asia. Kindhearted taxi drivers who tried to hurry the wounded to hospital, no charge, found out for themselves about the dysfunction of the system. Instead of being allowed to freely pass the toll booths, they were stopped and demanded a fee, the Hong Kong newspaper Ming Pao reports. The toll booth operator said that only vehicles carrying relief supplies can pass free of charge.